Chicken is hot! The last year saw the rise of the Hot Chicken Takeover and other special chicken creations. In spite of this recent uptick in what has historically been a foul attitude to supporting progressive approaches to poultry, finding good chicken has never been easy. Doing a little Wiki-research I found a morsel of history which indicated regular chicken eating is a relatively new dining choice. KFC did not really take off until the 1960’s. While Columbus does boast the infamous Chicken Corner / Chicken District even this chicken churning center has taken some hits over the last couple years. One business burned down, another went out of business and nearby Woody and Jo’s shuttered its bullet ridden shutters. Yes, if you are a chicken lover it has not always been an easy time to fill your need to feed. Well Double Comfort is here to help. This restaurant has a little bit if a twist that is noteworthy. Double Comfort gives a portion of their proceeds to local food pantries. The space also has a little challenge. Double Comfort took over the former space occupied by Knead. Knead, not unlike chicken, struggled to be fully embraced. Something about this high traffic section of High Street seems to not draw the foot traffic neighbors just a black away can count on. On the plus side, Double Comfort has two things going for it. One is owner Mary Lyski. She lived in Memphis, a city that does chicken right, for a decade. Wanting to get the taste of southern style fried chicken right she spent two years tweaking a recipe. Then she teamed up with Ben Walters from North Market Spices to get the special herbs and spices right. The second plus, and in my eyes the biggest, is Chef Dan Varga. Chef Dan has been one of my local favorites. He did amazing food at Explorer’s Club. I came to know him through the restaurant, helping him launch a food cart for the restaurant and gave him a strong endorsement by having him cater my wedding. Dan has worked hard to get the other dishes on the menu dead on good. At Explorer’s Club he excelled at figuring out the nuances of ethnic cuisines and putting menus together that would have made anyone from the country of origin proud. 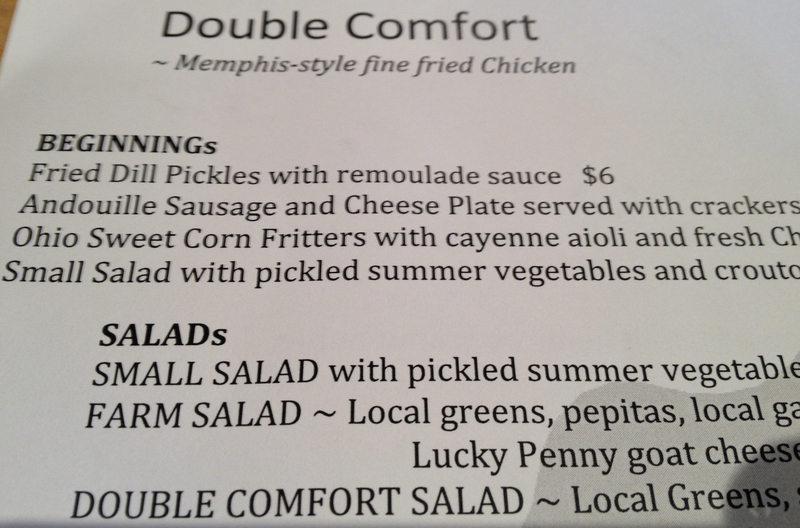 At Double Comfort Dan gets to cook from recipes inspired by his own rural roots. 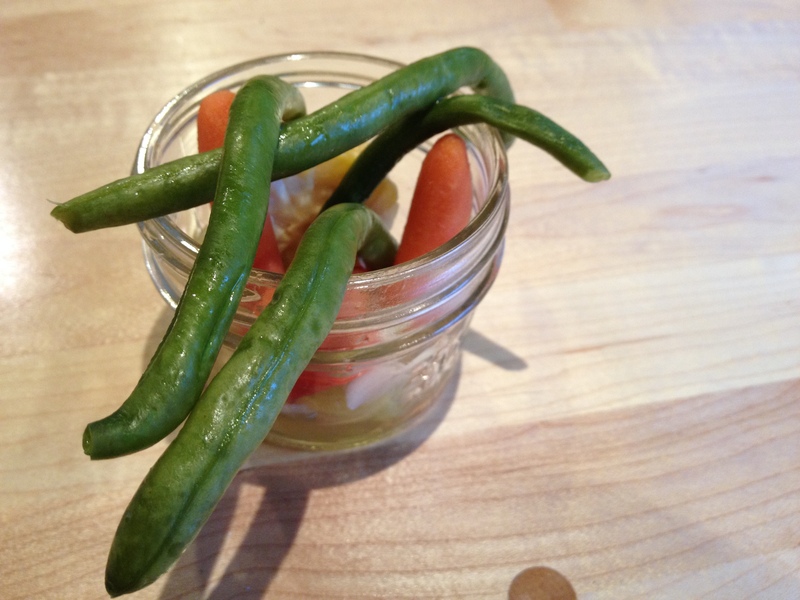 And he gets to pickle vegetables to perfection. 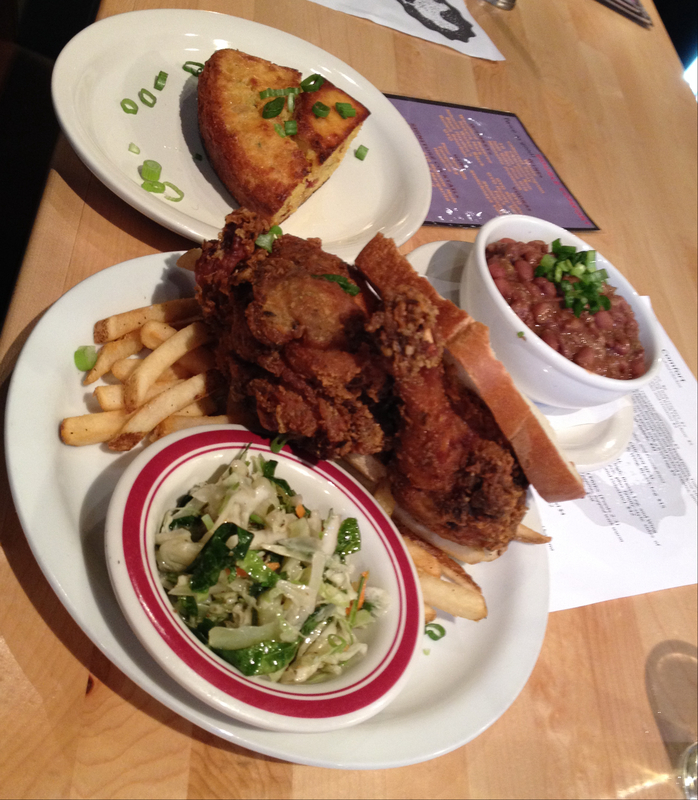 While Fried Chicken is the focus, there are plenty of other Southern favorites to enjoy. One of the guys in the kitchen has been frying chicken for over 40 years. So is the fried chicken good? Yes, yes it is. The breading is neither too thick or too thin with just the right amount of seasoning. The meat is juicy and tender and cooked to perfection. Double Comfort is the total package for southern fried favorites and your meal supports efforts to make sure someone else than needs a meal gets one. That is a double treat. This entry was posted on September 24, 2014 at 6:04 AM	and is filed under restaurants. Tagged: Dan Varga, Double Comfort. You can follow any responses to this entry through the RSS 2.0 feed. You can leave a response, or trackback from your own site.